All these detergents are made starting from a family of ingredients: SURFACTANTS. Surfactants are compounds that lower the surface tension of a liquid and therefore they emulsify the grease and the dirt on our skin and help us to wash it off with the aid of water. – cationic – positive charge when ionized. They are mostly used in conditioners. – anionic – negative charge when ionized. They are largely used in detergents and shampoos and provide good detergency and lather. In this family we ding: SLS (sodium lauryl sulphate), SLES (sodium laureth sulphate), ammonium lauryl/laureth sulphate, sodium lauroyl sarcosinate, disodium laureth sulfoccinate. – non-ionic – no charge (unionizable). They are lauryl glucoside, decyl glucoside, coco glucoside, caprylyl/capryl glucoside. These are usually not used in shampoos because they don’t leave a comfortable feeling on the hair (it makes them feel dry) unless they are included in the formulation in small amount (and therefore they work more as foam stabilizers). – amphoteric – both positive and negative (depending on the pH). These are used a lot in shampoo formulation: specially if combined with SLES they help the shampoo to be thick and they also decrease the irritancy (read this in a relative way 🙂 ). They are for example: cocamidopropyl betaine, lauramidopropyl betaine, coco-betaine, cocamidopropyl oxide. How “strong” do we need our detergent to be? This of course depends to what we aim to make: if we are going to make a bubble bath it will need to have a higher washing ability than a face-wash, which should, on the contrary, be very gentle and delicate. The washing ability of a detergent is determined by its “Active Matter” coefficient: every surfactant has an “active matter coefficient” which is a number in percentage (for example the SLES coefficient is 27%) and this tells us “how much active washing substance there is in our SLES… and in this case it is 27%”. This is because the liquid surfactants which we can easily find sold online are usually made of the real surfactant and water (so the active matter is not 100%). You should find out this number from where you purchase your surfactants (if they are not mentioned on the page, send an e-mail to the supplier). In a formulation a single surfactant results more harsh than an equal “active matter %” formulation made with different surfactants. To make it simple: if you mix surfactants together, you will have a milder results than using the surfactants alone. A particularly happy mix is SLES with a betaine (usually I have cocamidopropyl betaine) because not only the betaine lowers the harshness of the SLES, but it also thickens the solution. – anionic or non-ionic surfactant; it is the surfactant which we will add in our detergent at higher %. – anphoteric surfactant; it will make the first surfactant more mild. – extra surfactants: these are used in very low percentage and are added to improve the lather or the consistency of the detergent. building, it will help you to increase traffic. Thx I’m new in this field. So I can’t give my opinion. Thank you for sharing your expertise and detailed explanation for a newbie to understand. I had just formulated a liquid hand wash which turned out “liquid’ as you have explained, going my wits about what went wrong, then I found you! Such a blessing! Now, I will try this approach using SLES, SLS, and Coco Betaine. I really hope I don’t have to add salt. In the event, I guess, I’ll have to start at 1% is this correct? Don’t use SLES and SLS together. Could you use Sls and cocamidopropyl betaine or Slsa and cocamidopropyl betaine together? Sorry but I am new to this and trying to formulate a bubble bar recipe that uses cocamidopropyl betaine that would act as a foam booster but also help the Sls become milder. I have both SLS and SLSA to hand and want to try them both out. Hi, are you talking about SLES? Cause I dunno what SLSA is. This combination is a very simple and effective one. Good Stuff. Very Good Stuff. Let me read part II, then you can quiz me. I’ve heard Disodium Lauryl Sulfosuccinate is more gentle, is it still pretty harsh if used in a low percent without an anphoteric surfactant? Thank you! It is very gentle indeed, yet I always tend to pair surfactants together, however in this case I have seen it in some commercial products used as the sole surfactant. The only problem is I don’t think a blog will be allowed as a reference! Can you point me to where you got this information? I don’t remember reading this anywhere on a book. I just figured this out by comparing formulas of products which are sold. You can reference the blog. I need to make a body wash for low level atopia/ itchiness. I used cocoa and decyl glucoside 1:2 in 5 and 10% respectively, which makes my skin dry. Now Im being offered sodium lauroyl glutamate and/or sodium cocoyl glutamate as hypoalergenic, but I dont know how should I use these, I mean percentages and combinations with other detergents. I would be grateful for any help. If it is a skin condition you should first contact a dermatologist. What you can formulate is simply a delicate body wash which won’t solve a skin condition but that might not make it worse. You add the suggested concentration of use on the MSDS of the ingredient. However, you can add ingredients to make a detergent milder: a 1-2% of oil for example, an hydrating ingredient (glycerin, for example). 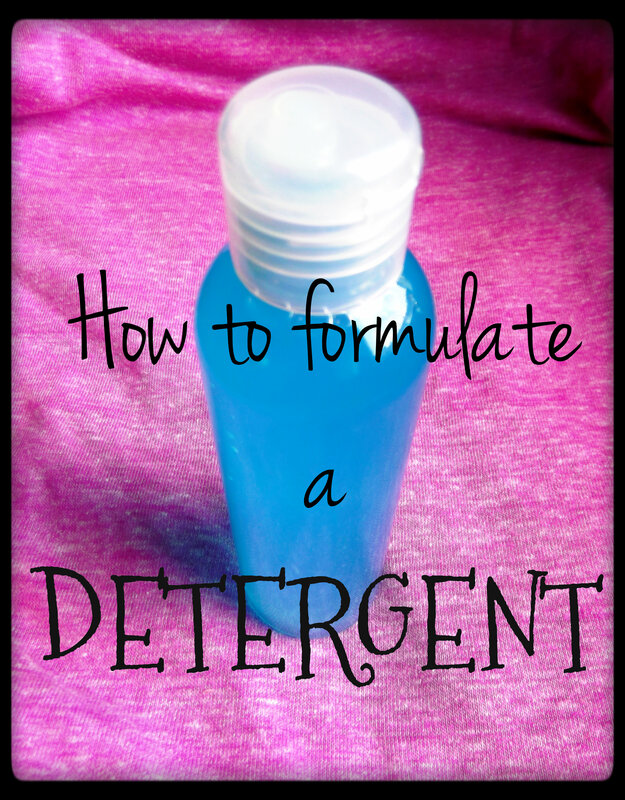 These are cheap ingredients that can really make a detergent more mild.